Yoga on an unstable surface brings a new set of challenges to your game and can bring your skills to the next level- all while taking in the natural beauty of summer in Vermont. 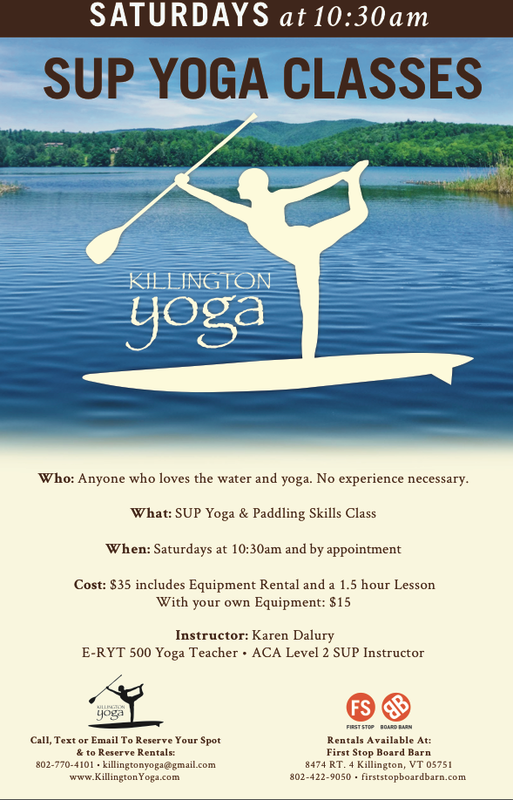 Any level of yoga or SUP experience welcome. Beginner through advanced performance paddling. Learn the basics of stopping, turning and safety. Already a paddler? Want to get better and feel more comfortable in all conditions? Learn to go straighter or how to handle the chop and wind with ease and comfort. Learn to move around on your board and turn on a dime. Sup fitness training. By honing your technique with a pro you will get an amazing workout using your entire body! Get the glide! Private: 1 1/2 hours $95, $35 each additional student. With your own equipment $75/25. Small group: $35 per person (5 person minimum) includes equipment. With your own equipment $15 per person.